Christopher Stephens completed his BFA in Painting/Printmaking from the University of North Carolina at Greensboro in 1983. He continued his studies at James Madison University in Harrisonburg, Virginia, where he received an MFA in Painting in 1997. Stephens’ work is primarily oil landscapes, with experience in clay, plaster and wood sculpture, handmade paper and mixed media. Stephens’ oil landscapes depicting northwestern Virginia reflect his intention to capture color and light. 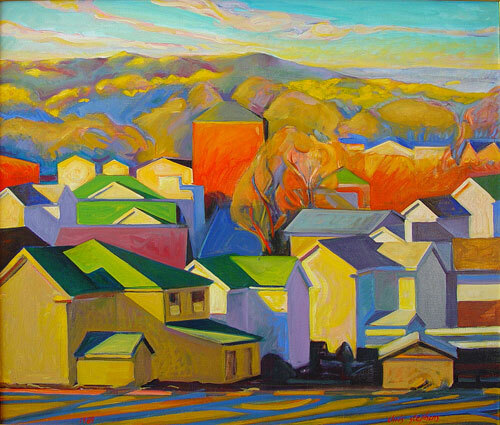 Painting from life, he explores the landscape’s changing seasons and light through repetitive visits to the same sites. Red Tower shows Stephens’ focus on light through the use of vibrant hues and wide range of value. Stephens taught art at the elementary school and university level, and has widely exhibited his work along the eastern seaboard. His art is also represented through various regional collections, including Green Hill Center for NC Art and Raleigh Contemporary Galleries.